Oswald in the Doorway (not) : the blog of the Oswald Innocence Campaign,debunked by Lance Uppercut: Oswald Innocence Campaign 2 - Double the stupidity! Oswald Innocence Campaign 2 - Double the stupidity! 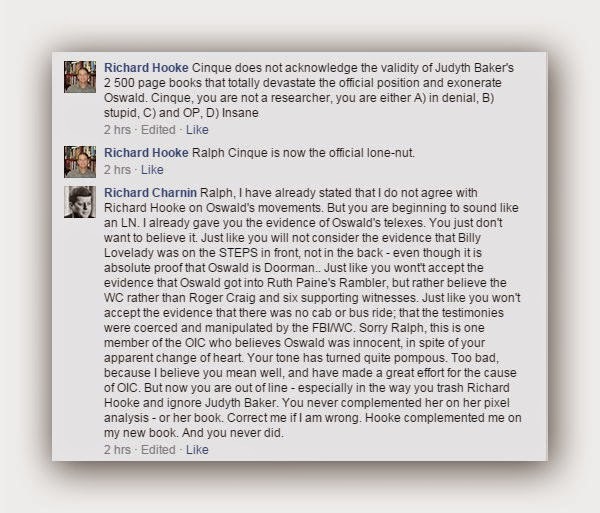 In breaking news, senior members of the Oswald Innocence Campaign that Ralph Cinque has pissed off in the last few weeks have formed a breakaway group on Facebook, and in a move clearly calculated to irritate the crap out of the mental midget from Buda have named it, quite brilliantly, the "Oswald Innocence Campaign". To rub Ralph's nose in it even more, the group has been set up by his arch nemesis and the first OIC senior member to resign - none other than Judyth Vary Baker. Membership is growing quickly, and already includes official OIC senior members Richard Hooke and Richard Charnin, along with none other than the chairman of Ralph's idiot club, Professor Jim Fetzer. I don't know about him being a tool of the establishment, but it's certainly true that most reasonable researchers concluded long ago that Cinque is a tool of some sort. Still, at least the rest of the OIC lunatics are waking up to the realistion that the leader of the asylum is a total fruitcake, which is a good thing if only for the fact that their protracted arguments have contained some genuine comedy gold. 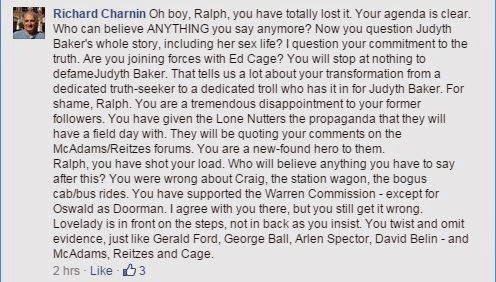 Of course every one of them is wrong about the Doorman issue, which only serves to make their constant bickering about the comical mis-identification of practically every figure in the Altgens photo all the more amusing. It's only the in-fighting which makes the OIC even vaguely worth commenting on these days, but a double daily dose of stupid looks certain to liven things up! Good luck with that! Apparently you only have to be "fairly certain" that Oswald is in the doorway to get in....! I reckon he was in the doorway entering and exiting work before 22 Nov. I know he wasn't in the doorway in altgens 6. Does that count ? Didn't this happen a long time ago with what's his name? Martin Luther? Don't forget……. they gave Dr. Cinque a standing ovation at the First Annual OIC Convention. It's on YouTube!! !